The School site is now known as the Outdoor Classroom Project. In 1913, this one hectare erf 1 of portion 394 was allocated for a non-denominational school. 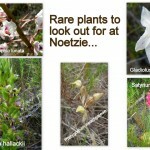 In December 1998, Noetzie acquired Conservancy status with Cape Nature. The members elected a committee to represent what is now known as the Noetzie Conservancy Owners Association (NCOA). Over the years, the various NCOA committees have planned educational features for the property to uphold the legacy of the site that was granted to Noetzie, including a school, an education centre and a visitor centre. In 2009 residents Julie Gosling and Wendy Dewberry began to care for the property and develop it into an outdoor educational facility which could be used by all. 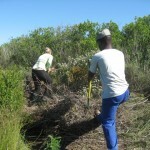 Julie and her company Action Ads had the property cleared of all the alien vegetation which was threatening to choke the fynbos. This included huge pine trees, pampus grass and various shrubs. Of the many people and interest groups we asked for advice, we were thrilled to have a visit by the Outramps CREW group and a representative from SANParks. 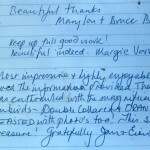 We are thankful for their valuable and encouraging input. This is a very laudable project which aims to conserve some of the precious land that has been spared from development along our coastline. The NCOA is doing an excellent job and we wish them lots of luck in their endeavours. 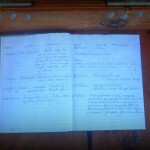 We have compiled a species list for the property, which is enclosed. 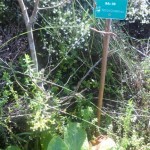 It is no way comprehensive, but will go some way to helping others identify the plants that grow on this property. We found some mistakes in the labelling, which will be corrected. 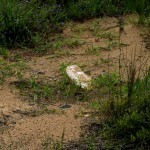 There are a number of Plants of Special Concern that could occur here in the future. Johan Baard of Sanparks has mentioned Gladiolus vaginatus (Vulnerable) and Pterygodium newdigateae (Vulnerable) in his report. Satyrium princeps (Vulnerable), Disa hallackii (Endangered), Acrolophia lunata (Endangered) and Disa newdigateae (Critically Rare – Presumed Extinct) are all possibilities. Disa newdigateae has not been seen for about 100 years, so would be a huge find. 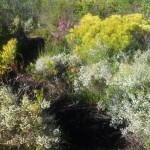 We would be very interested to hear if any of these plants occur on the property in the future. To this end, I have included photographs except for Disa newdigateae. 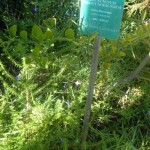 I am unable to access a photograph of this very rare plant. We have also included the official site sheet for erf 394/1. This goes to the South African National Biodiversity Institute in Pretoria. 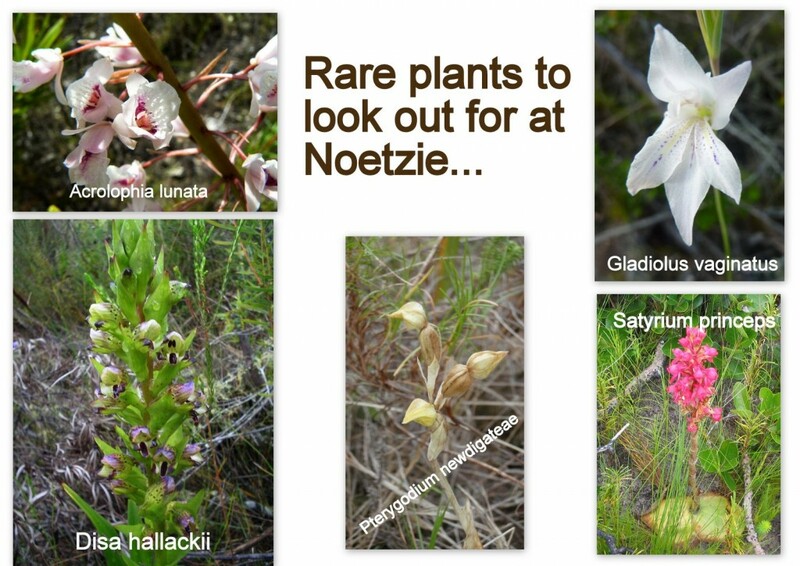 The data is used to update the Red List of South African Plants. 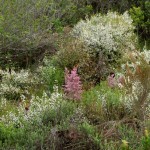 We are the first country to comprehensively assess our very diverse flora. A staggering 20456 taxa have been evaluated. The core function of CREW is to collect data so that the Red List is kept up to date. 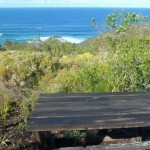 Julie has put in benches for people to sit and enjoy the beautiful scenery. 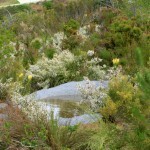 Wendy designed and had information boxes made by Epilepsy Knysna, which now house a guest/comment book and information about the site and its pristine fynbos. If you come across a patch of white sand on the path, don’t be wondering how the table mountain sandstone got so blond in one little patch – it is an interactive spoor-spotting patch of sea sand. Every now and then, a stealth camera is set up. So far, small buck, blond bush pigs and grey mongoose have been spotted. A pond, the latest addition, was built to catch the ample water which flows over the area during heavy rains. For Summer days in season a- ‘quick-to-erect’ bird hide is available. 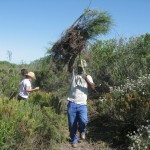 There is a lot of other information on the OUTDOOR CLASSROOM, primarily about Coastal Fynbos and why it is threatened. 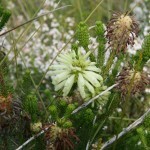 This tiny node serves to exhibit a fine example of coastal fynbos. 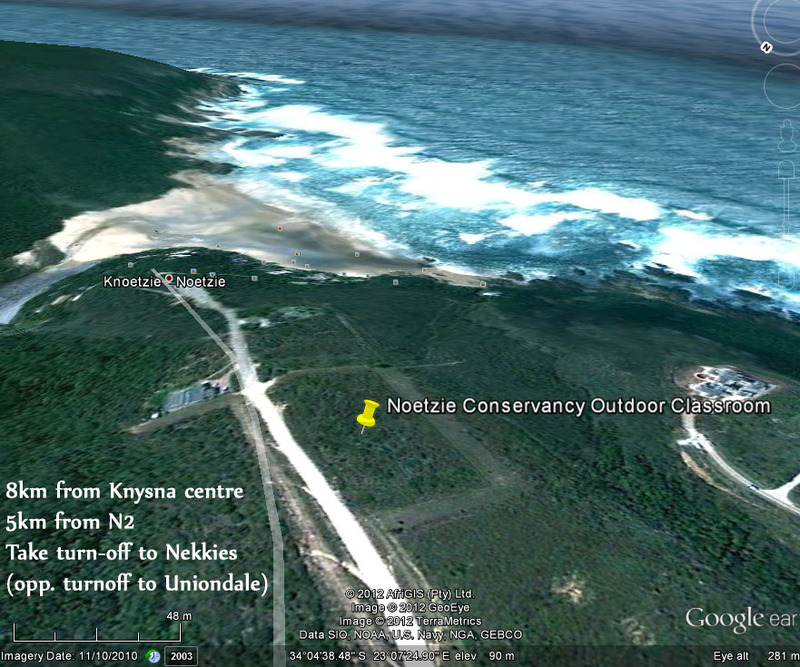 Please take a tour, (it is free) on your visit to Noetzie. 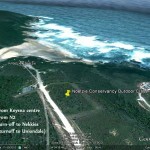 The GPS Co-ordinates are S 34 04.646 E 023 07.459 at 82 m elevation. It is not signposted. Actually, it is hidden in an attempt to keep vandals at bay. How sad. But that’s how it goes. If you visit it, though you may be delighted. To get there, travel 4.8 Km from the N2 on the Noetzie road, travelling South East on the District Road DR 1771. En route you will pass Pezula offices and then descend downhill. At the bottom of the hill you will see the first house on the left hand side, and a sign announcing the Noetzie Conservancy. Over the road, opposite the sign is an area to park your vehicle. The entrance to the NOETZIE OUTDOOR CLASSROOM is a few paces down the hill, to the right. 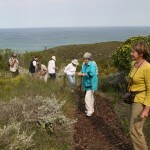 The path parallel to the road will take you through pristine Coastal Fynbos. 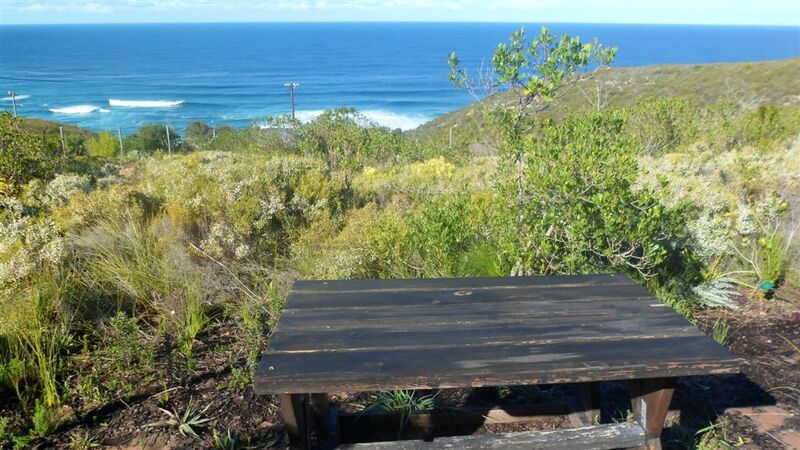 There are benches too, so if you take along a picnic you will experience unsurpassed views of the vast ocean with your meal – all for free, can you believe it? I think you will be happy to drink your best bottle on that site! We only ask that you leave the area as you found it, but please sign the visitors book on the way out. The one thing we would like you to leave is your name and comments. The latest addition to the Outdoor Classroom is our River Monitoring Program. The Conservancy has acquired instruments to measure water quality of our Noetzie River, and its members have set up a monthly monitoring program to record data and observations for the future use of the Conservancy. If you would like to know more, please visit the site where there are information stations.